Frank Lynch's previous experience as an insurance defense lawyer, his current practice as a Plaintiffs' personal injury and workers' compensation attorney, and his knowledge of and dedication to issues facing the community offers Wolter, Beeman, Lynch & Londrigan, LLP unique depth and experience in personal injury and work injury litigation. Frank graduated from SIU School of Law in 1983. He worked as a litigator at an in-house insurance defense law firm attached to First Financial Insurance Company and Special Insurance Services in Springfield, Illinois. In 1986 he joined the Springfield branch of Heyl, Royster, Voelker and Allen, a state-wide insurance defense firm. He represented insurance companies in fields of automobile, premises, liquor, medical malpractice, and professional liability. 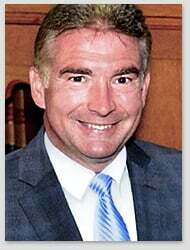 He was made a partner at Heyl, Royster, Voelker and Allen in 1994. 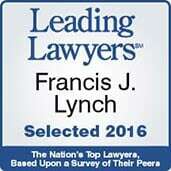 In 1997, Frank joined Bruce Beeman and Randy Wolter to form a Plaintiffs' Litigation and Tort practice. Wolter, Beeman, Lynch & Londrigan, LLP now serves Central Illinois as a general litigation firm, concentrating in Plaintiffs' personal injuries, civil trials, and workers' compensation. The firm focuses on representing the injured in civil and workers' compensation claims against insurance companies. Frank has obtained numerous seven figure verdicts and settlements. With Bruce Beeman he obtained the highest jury verdict in Sangamon County history for over $24,000,000.00 arising out of an automobile accident. Frank has been a lecturer, speaker and author for the Southern Illinois University Law Journal, the Illinois Institute for Continuing Legal Education, the Illinois Defense Research Institute, the Illinois Bar Association, the National Business Institute, and the Illinois Trial Lawyers Association. He has published and lectured on issues of evidence, trial procedure, discovery, and Illinois Workers' Compensation Commission practice and procedure. He has been named an Illinois Leading Lawyer by the Leading Lawyers Network, an Illinois Super Lawyer by Illinois Super Lawyers magazine, and one of the top lawyers in Illinois as published in Chicago Lawyer. He has the highest peer review rating possible from Martindale-Hubbell, and as a result of his rating, Wolter, Beeman, Lynch & Londrigan, LLP is an AV rated law firm. He is a Senior Fellow of the Litigation Counsel of America and a Barrister of the Lincoln/Douglas Inn of Court. Frank is a member of the National Association of Eagle Scouts. He currently serves on the Board of Directors for the United Way of Central Illinois and served as the Board Chair for 2017-2018. For several years he served as a United Way Community Fund panel volunteer. For several years Frank also served as the President of the Board of Directors for the Sangamon County Emergency Food and Shelter Program, and he remains a Board Member for that organization. He is a donor/sponsor and volunteer for Springfield Helping Hands Homeless Shelter, Boys & Girls Club, and Springfield MERCY Communities. He is a past Board Member, Trustee, and Board President for the Springfield YMCA. In 2014 Frank was selected as the Volunteer of the Year for the Illinois Institute of Continuing Legal Education. In 2016 Frank was awarded the Springfield Good as Gold Distinguished Volunteer of the Year.